I am a Registered Guitar Teacher and am Registered with the RGT. • "Open" scales of E Natural Minor, E Blues and G Pentatonic Major - 2 Octaves. • "Fretted" scales of A major and A Pentatonic Minor - 2 octaves. • Major chords - A, C, D, E, G.
• Minor chords - Am, Dm, Em. • Dominant 7th chords - A7, B7, D7, E7. • Major 7th chords - AMaj7, CMaj7, DMaj7. and other indications may be marked, however the style of the performance will be left to the candidates initiative. • As 4a above, but with an alternative sequence in a different style. • Methods of achieving fluency and clarity in playing. • Notes on the fingerboard. • Tone production, basic anatomy and mechanism of the instrument and other general knowledge of the instrument appropriate grade. • Pitch tests, including recognition of intervals. • Harmony tests, including recognition of chord types. • C Major and G Major - 2 octaves. • B Pentatonic Minor - 2 octaves. • A Natural Minor - 2 octaves. • D Pentatonic Major - 2 octaves. • A Blues and G Blues - 2 octaves. • "Non-barre" chords - Am7, Bm, C7, Em7, FMaj7, G7, GMaj7. • Chords using half-barre - Dm7, F, F#m. • The examiner will play a chord sequence similar to that presented in section 3 above. The candidate will be required to impro this, demonstrating the practical application of scales from section 1 above. • As above, but with an alternative sequence in a different style. production, application of specialist techniques (including string bending, vibrato, slurring etc. where appropriate). such as the use of specialist techniques. transpositional patterns is advised. Candidates using Acoustic guitars will not be asked to play in inaccessible keys. • 2 octave Major scale. • 2 octave Pentatonic Major scale . • 2 octave Pentatonic Minor scale. • 2 octave Blues scale. • 2 octave Natural Minor scale. • All Major and Minor 2 octave fretted arpeggios. • The examiner will play a chord sequence similar to that presented in section 3 above. The candidate will be required to impro this, demonstrating the practical application of scales and arpeggios from section 1 above. • Pitch tests, including interval recognition. • Harmony tests, including key type recognition. At this grade candidates are required to know the scales and arpeggios listed below in ALL keys. should be familiar with those required for previous grades. 2 octave Major scales with 2 different fingerboard positions. 2 octave Pentatonic Major scales with 2 different fingerboard positions. 2 octave Blues scales with 2 different fingerboard positions. 2 octave Natural Minor scales with 2 different fingerboard positions. All Minor 7th, Dominant 7th and Major 7th 2 octave fretted arpeggios. this, demonstrating the practical application of scales and arpeggios from section 1 above. As 4a above, but with an alternative sequence in a different style. Methods of achieving fluency and clarity in playing. • Recognition of time signature and beating of pulse. descending, and from memory. In addition, candidates should be familiar with those required for previous grades. • 1 octave Pentatonic Minor scale in 5 different fingerboard positions. • 1 octave Major scale in 3 different fingerboard positions. • 2 octave Pentatonic Major scale in 3 different fingerboard positions. • 2 octave Harmonic Minor scale. • 1 octave Pentatonic Minor scale in 5ths. • All chords listed in previous grades. • Alternative sequence in a different style. • Intervals and notes on the fingerboard. • Use of scales and arpeggios. be familiar with those required for previous grades. • Natural Minor scale - 1 octave in 5 different fingerboard positions. • Major scale - 1 octave in 5 different fingerboard positions. • Dorian modal scale and Mixolydian modal scale - 2 octaves. • Chromatic scale - 2 octaves. • In 8ths: Major scale and Pentatonic Minor scale - 1 octave. • In 3rds: Major scale - 1 octave. • Accuracy, evenness and distinctness will be rewarded in particular. • All Major 9ths, Minor 9ths and Dominant 9ths. • All Diminished 7ths and Augmented 5th chords. • Candidates will be given a chord sequence to play containing chords selected from section 2 above. • Candidates may be given an additional chord sequence to play - a performance in a different style would be expected. • Achieving clarity and fluency. • Application of scales and arpeggios, and application of extended chords. • Anatomy and mechanism of the instrument, and other general knowledge of the instrumentappropriate to the grade. • Harmony tests, including recognition of chord type. • Sight-reading from standard notation or from tablature. addition, candidates should be familiar with those required for previous grades. • 1 octave Pentatonic Major scale in 5 different fingerboard positions. • 2 octave Dorian modal scale and Mixolydian modal scale, both in 2 different fingerboard positions. • 2 octave Phrygian modal scale and Lydian modal scale. • In 8ths: 1 octave Natural Minor scale. • 2 octave Whole-tone scale. • 3 octave Pentatonic Minor scales and Blues scales of F to C inclusive. • 1 octave Minor 7th and Dominant 7th arpeggios including # or b 5ths and/or # or b 9ths. • All Major and Minor chords using "non-root" or altered bass notes. • All Minor 7th and Dominant 7th chords using altered 5ths and/or altered 9ths. • Candidates will be given a chord sequence to play containing chords selected from section above. production, appropriate application of specialist techniques (including string bending, vibrato, slurring etc). • Application of scales and arpeggios, and application of altered chords. • Anatomy and mechanism of the instrument, and other general knowledge of the instrument appropriate to the grade. Recognition of time signature and beating of pulse. Pitch tests, including recognition of intervals. Harmony tests, including recognition of cadences. Sight-reading from standard notation or from tablature. • 3 octave Chromatic scale F to C inclusive. • 1 octave Dorian modal scale and Mixolydian modal scale, in 3 different fingerboard positions. • 1 octave Phrygian modal scale and Lydian modal scale, in 2 different fingerboard positions. • 3 octave Major scales of F# to C inclusive. • 3 octave Natural Minor scales of F to C inclusive. • 2 octave Locrian modal scale. • 1 octave Dominant 11th and Dominant 13th arpeggios. • All scales and arpeggios listed in previous grades. • All Dominant 11th and Dominant 13th chords in 2 different fingerboard positions. • All Major chords and Dominant 7th chords in 5 different fingerboard positions. • Candidates will be given a chord sequence to play containing chords selected from above. • The examiner will play a chord sequence similar to that presented in section 3 above, which may include key modulation. This will be required to improvise over this, demonstrating the practical applications of section 1 above. • The practical applications of the scales, chords, techniques etc. used in sections 3 and 4 above. • Intervals, chord formation and chord relationships, modulation and transposition. • General knowledge of the instrument and its techniques. • Harmony tests, including recognition of chords and cadences. 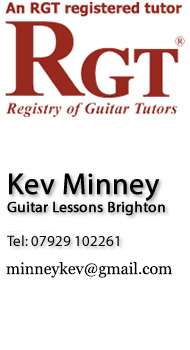 Kevin Minney offers all types of guitar grades. From electric to acoustics to classic and the bass.